This weekend marked the first Draft event in Eternal. As someone who mostly drafts, I was quite excited by the prospect, especially once I heard that they would be tweaking the format a bit. For this event, we wouldn’t be drafting 3-2-1-3 as normal. Instead of drafting individual packs of Sets 1 and 2, we got two curated packs of cards from those sets mixed together, with a stronger focus on tribal synergies that would mesh with Set 3’s themes. Personally, I’m hoping that this was a dry run to see how the format would shake out, to see if it would be worth drafting this full-time. Because it was great! 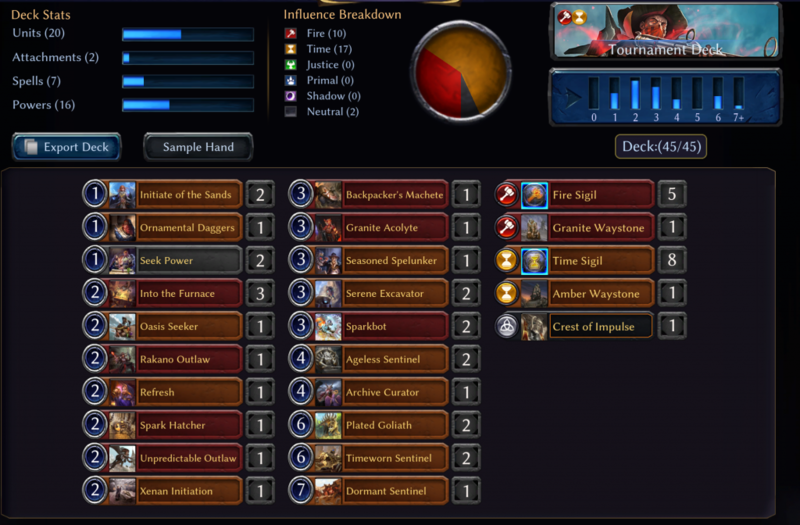 Of the three decks I drafted, each one felt more cohesive than any deck I’ve had in a long time. I wasn’t afraid to go in on tribal payoffs in Pack 1, and I got rewarded in Pack 4 for leaning a little harder on tribes than I normally would. That’s what the format should feel like. Unfortunately, an expensive entry fee (7,500 gold), combined with poor prize support, took what should have been an incredible event and made it frustrating, even for someone who did a great deal of winning. I finished 24-6 overall in the event, good for an 80% win rate and a top-15-ish ranking. I say “ish” because I was 10th as of the writing of this article, but I will likely drop at least a slot or two before the end of the event. The payout for top-100 is three free draft tickets, 10 packs, and 3 premium copies of Strategize. Considering the draft tickets at 5,000 gold each, that’s 15,000 gold Not bad, right? Wrong. If I kept up a similar win-rate in normal drafts, I’d be getting three diamond chests per run. At three runs, that means I get paid out 9 packs, 9 random premium cards, and an average of 18,450 gold. I put in 15,000 gold for those three drafts, so I’m up 3,450 gold, 9 packs, and 9 premiums. In the event, I put in 22,500 gold to enter three times. I will come out 10 packs, and 4 premiums ahead, but 7,500 gold down. I’ll call the premiums a wash, since Strategize is a very widely-played and desirable premium, versus what will likely be a bunch of chaff. There is still about a 10,000 gold delta there. I will probably finish between 15 and 20. Of ten thousand players. Let me make that clear: I finished in the top 0.2%, won 80% of my games, and I am still 10,000 gold in the hole from where I would have been normally. I can’t think of an event in any game that has had a worse payout than this one. I’m an avid drafter, so I don’t mind losing the gold to play in a special event, but it’s just plain not good design to have the expected value be so low. If you are an average player (i.e., you go 15-15), you’re better off just lighting some cash on fire. I’m fortunate enough to have a bit of disposable income, but if DWD wants to attract the people who can put a few bucks a month here or there, the ones that make up the backbone of a playerbase, they need to adjust these payouts significantly. The game is overwhelmingly generous in other areas. They clearly intend for events to be a moneymaker. I get that. But if they want people to keep playing in those events, they need to make them more friendly to the average player. Paying out per run would be a huge step forward. I sank 22,500 gold into this thing, and I won’t see any return until the event ends. If I had just done one run, even if I went 10-0, I would have put 7,500 gold in for a crappy return (no diamond chests, remember), and I wouldn’t be able to draft again until they pay out my free ticket at the end of the event. That’s a pretty negative experience. Rewarding players for strong single runs, as well as giving a few extra rewards to the top performers at the end of the event, would be a much better prize structure, especially when the entry fee is so steep. They gave little-to-no warning for people to save up gold, which may have been intentional because they wanted us to buy gems. It was made doubly painful by the fact that there wasn’t really a point to entering if you didn’t intend to play your full three runs. Well, enough ranting about the awful prize structure. Time to show off my sweet decks. What’s this? A Praxis deck with an actual good curve and plenty of sentinels/explorers? I had no idea such a thing existed! I first-picked Seasoned Spelunker out of a mediocre pack, followed up with a couple Into the Furnace, and then I was off to the races. Packs 2 and 3 were very kind, showering me in above-average playables, and I was able to focus on picking up synergies in packs 1 and 4. This deck didn’t do anything particularly special, but it also had a very high floor. Serene Excavators did a ton of work, which is not a phrase I expected to ever utter. The highlight of this deck was, at 7-2, mulliganing into a hand that did actual nothing until turn 7. Seriously, the only play I could legally have made before turn 7 would have been to Refresh my face. I mulled into 4 power and drew nothing but that and weapons to go with my Dormant Sentinel. Fortunately, the event didn’t seem to pair by record or MMR or anything, since I was facing a player who was pretty obviously new at drafting. 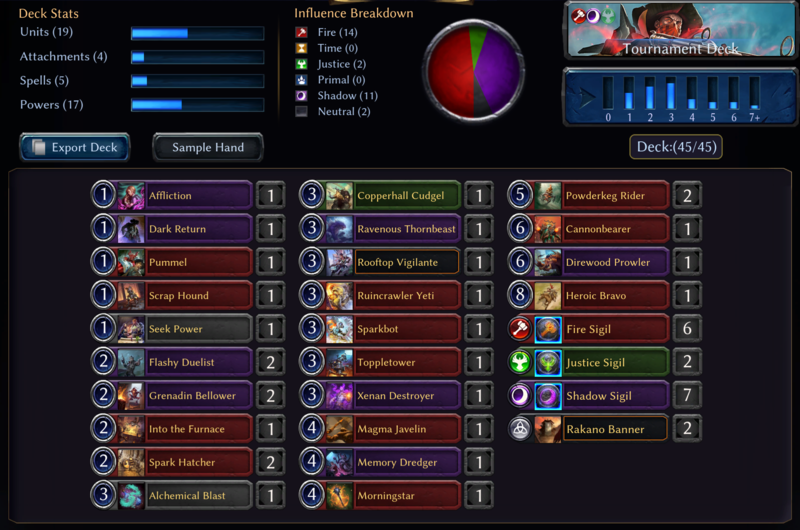 Their deck didn’t do much of anything in the early turns, and even a lonely Dormant Sentinel was enough to get me to 8-2 despite them playing a Scouting Party that drew 3. Phew. This deck was a work of art. I got to make so many sweet plays with the sacrifice outlets and had fun burning people out with double Rapid Shot. I got to draw cards, make huge dudes, beat down, and just generally put a whuppin’ on people. I don’t actually remember how I lost in the one game that I did lose, but this deck was just absurdly powerful and deserving of going 9-1. Look at all those Set 1 and 2 cards in the deck. You’d never see that many in a regular draft; the sets just aren’t deep enough, particularly Set 2. Prickly Grenadin was a bit of a stinker alongside all of the Nightfall cards (we call that a non-bo), but I had enough sacrifice outlets that any warm body was good enough. The sweetest play I made with this deck was to attack with my 3/4 Powderkeg Rider. Recognizing (correctly) that they needed to get it off the table because they were a bit low on life, my opponent gang blocked it with the whole squad. Five creatures. I Devoured another grenadin, then had Rapid Shot to complete the 5-for-1. Granted, had they just not blocked, they would have died, but it still felt real, real good. 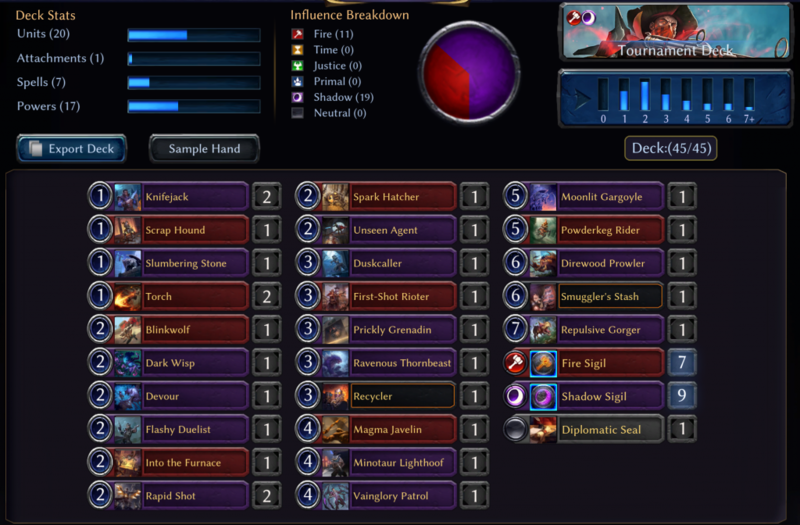 If you do the math, you’ll come to the conclusion that I went 7-3 with this deck. I feel that’s probably about right, maybe even over-achieving by a win. Again, this one had a ton of raw power, but it was markedly less consistent than the previous two. I did not strictly have to splash, but I think it was correct for an event of this type. At 17-3 already, I was almost a lock for top 100, even with a mediocre finish. However, to crack the top 10, I needed to hit 8 wins or better most likely. A card like Rooftop Vigilante can just straight-up steal games you had no business winning, especially when you have a copy of Dark Return to force it through their only removal spell. I think it was better to raise the ceiling on the deck’s power level to try and spike my way to 8 wins, even if it lowered the consistency a little bit. I did not like that I had to play Heroic Bravo, though he put in some fine work. I didn’t quite have the density of Gunslingers I might want. Ruincrawler Yeti is another card that’s fine, but not exciting. I never hit anything with it, of course. He was hiding on the bottom of the deck when he mattered and soaking up warcries when I would have rather they went on something like Xenan Destroyer! Nonetheless, I started 6-0. At 23-3 overall, I felt like I had a real shot at the top of the leaderboard. Sadly, the deck’s inconsistency caught up with me. I had some mediocre draws, while my opponents had good ones, and that was enough. The most frustrating thing was losing my final game to a Mystic Ascendant that I had zero ways to remove. Had I won that game, I could have locked up a top-10 finish. Ah, well. I only drew Memory Dredger in two games, both of which I was winning handily. Sadly, it was nowhere to be found in the two games where I was getting nibbled to death by Pteriax Hatchlings. The highlight of playing this deck was Dark Returning an already 7/6 Scrap Hound. I paid 2 mana to deploy an 8/7 and still had enough leftover to also deploy a Xenan Destroyer! A few chump blocks later, an adorable 13/12 metal dog ate my opponent’s face. I really had fun playing through the event, though I wish it had been a little less stressful. I’m fine with losing money on an event, but I feel like it shouldn’t take a 99.9th-percentile finish just to break even, and that’s where we are now. /u/_AlpacaLips_ on reddit intentionally finished 0-10 with an alternate account to suss out the bottom of the standings, and it’s currently near 10,000 players, so you have to be in the top 0.1% if you want to hit that top-10 break even point. To be honest, if I hadn’t started out 8-2, I wouldn’t have bothered to enter again. There isn’t a point to risking so much gold on a very minor potential improvement in prize support. I don’t think that is where DWD (or any of us, for that matter) want this to be, so I really hope they consider adjusting the payouts in the future, namely basing the rewards on each individual run, with a little icing on the cake for the top finishers. The actual draft format, on the other hand, was incredible. I really hope that people can get that message through to DWD, even despite our disappointment in the prize structure. I haven’t enjoyed the drafting portion as much as I did in this event since it was just Set 1. The gameplay, too, was much better than it has been. It felt much less like a cripple fight where you both have bad, non-synergistic and much more like a real game of Eternal. If this became the normal, every-day draft format, I would be dancing with joy. I really hope that’s where DWD was heading when they designed this event.